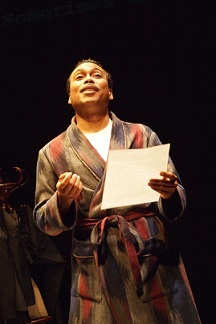 Gavin Lawrence as Langston Hughes in “Are You Now or Have You Ever Been…” Photo by Charissa Uemura. When it comes time to justify their work, the testimony of an artist speaks to much more than simply the words on the page. Although Are You Now or Have You Ever Been… is framed around Langston Hughes’ 1953 hearing in front of the House Un-American Activities Committee, it is not Hughes’ sympathies with the Communist Party that are the play’s primary concern. As we hear not one, but two testimonies by Hughes, it becomes clear that what is truly important is the necessity for art, the importance of context, and the subjectivity of interpretation. The play begins with Langston Hughes in his pajamas, struggling to write a poem while preoccupied with his upcoming hearing. Alone in his apartment, Hughes reflects on how he became a poet and how race and politics have affected his work. Actor Gavin Lawrence‘s portrayal of Hughes captures both a determined artistic idealism and the real financial constraints of professional poetry; as Hughes struggles to balance the desires of black and white readers – and the competing ideologies within the African-American literary community – he leans on the one thing he knows to be true: that fiction is a way to escape being alone, to imagine voices and experiences outside of our own. We get a taste of this escape in Lawrence’s impassioned and vivid performances of several of Hughes’ poems: there is no better of the power of art than a powerful piece of artwork. This is not a new idea, and one might argue that none of the ideas presented in Are You Now… are particularly new. But as Hughes himself points out in the play, newness is beside the point when it comes to artistic resonance. The point is that playwright Carlyle Brown‘s way of interweaving speculative musings, impassioned diatribes, and Hughes’ poems themselves is so seamlessly done that the play itself is like poetry to watch. But when Hughes’ opening monologue – essentially Act I of the play – yields to the HUAC hearing itself, we suddenly hear a different kind of testimony. This time, Hughes is not given the time or the artistic liberty to tell the committee what he has just so eloquently expressed to the audience. Joseph McCarthy’s panel barrages Hughes with questions, insisting on a “yes” or “no” to questions that Hughes insists are dependent on both literary and historical context. And, in the audience, we have just witnessed the proof that Hughes is right: having come to Hughes’ HUAC hearing with more complete information, we can see exactly the size and shape of the box that the panel is putting him into. It is ingenious, really, both how the play is structured and how the interrogators – in particular, Roy Cohn (John Middleton) – manage to get exactly the responses from Hughes that they were looking for. The treatment of race is powerful in its subtlety: when Hughes attempts to provide the committee with some context on racial oppression, the panel’s response (essentially, “we get it, move on”) proves just how little the congressmen really do understand. Time and time again, we see these Washingtonian legal minds unable or unwilling to grasp the concept of imagining oneself to be other than what one is, and the necessity of interpretation and creativity to understanding anything outside of a fixed perspective. Although this second half is faster paced than the one-man show that opens Are You Now…, it feels a bit slower, and this might be because we think we know what message we are supposed to take from HUAC’s aggressive questioning. But as Hughes stumbles out of the courtroom, suddenly incapable of speech after all these words, the consequences of narrow-minded and one-sided interpretations become much more severe. Are You Now… is a play that, like Hughes’ poetry, opens many doors and refuses to close them or to give the audience too many obvious signposts. Themes circle back on themselves, expanding out or spiraling inward in new and unexpected ways. The present-day parallels to anti-terrorist paranoia or partisan sound bites are there, to be sure, but this play is thankfully not a contemporary propaganda piece. And yet: in the current political climate, isn’t a play about poetry – a play this good about poetry – a pretty strong argument in itself?